Click here for a complete guide on what to look for. Featuring 41 cards. 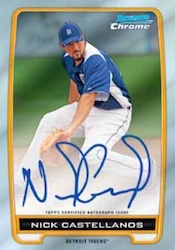 Click here to a comprehensive guide to 2012 Bowman Chrome Baseball Prospect Autographs including a full image gallery. Sean Nolin appears to only have a Gold Refractor parallel, which is numbered 20, not 50. Since its debut in 1997, the Bowman Chrome name has been synonymous with rookies, prospects and Refractors. The brand has continued to evolve, but the focus on baseball's young stars has remained true. Besides the slight increase in ink, there is not a lot that's new or groundbreaking in 2012 Bowman Chrome Baseball. Most collectors will still be chasing the black-bordered prospects and their numerous parallels. 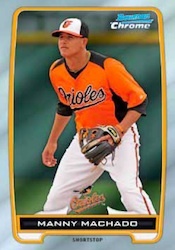 The 220-card 2012 Bowman Chrome base set is where collectors find the veterans and rookies. In fact, there are 170 established stars and 50 rookie cards. The real action, though, comes from the 110-card Prospects inserts, which pictures prospects in the Major League uniforms. Because these prospect cards are inserts and lack full licensing, they are not technically rookies. However, they are still highly coveted by collectors and can often be valued higher than their eventual official rookie cards. The Prospect cards are numbered 111 to 220, picking up from where the Bowman Chrome Prospects inserts left off from in 2012 Bowman Baseball. 2012 Bowman Chrome also hase 41 Prospect Autographs, most of which aren't a part of the regular Prospects set.. Signers include Nick Castellanos, Pratt Maynard, Shawon Dunston Jr, Matt Sczcur, Jake Marisnick and Jonathan Singleton. Both the base cards and Prospect cards have seven levels of Refractor parallels plus Printing Plates. Regular Refractors fall eight per hobby box and they get rarer from there. Other Refractors include Blue (#/250), Purple (#/199), Gold (#/50), Orange (#/25), Red (#/5) and Super-Fractor (1/1). While much of the focus will be on the basic 2012 Bowman Chrome Baseball set, Topps is amping up the inserts somewhat. Legends in the Making is the latest insert to use a die-cut design. Inserted 1:24 packs and focused on veterans, the set has 25 cards. There are also 15 autographed versions that are numbered to 15 or less. Signers include Yu Darvish, Yoenis Cespedes, Albert Pujols and Buster Posey. Franchise All-Stars is a 20-card set that matches up a 2012 Futures Game participant with a comparable MLB star. Cards fall one per hobby box. The concept is similar to the Mirror Image cards from mid-90s Bowman's Best sets. Five cards have dual autographed versions numbered to 25 or less. The Futures Game is further highlighted with its own insert set. Falling one per hobby box, the 45-card set will keep set builders busy. The set is paralleled by a collection Patch Relics that are numbered to 10. Ten players also have Futures Game Autographed Patch cards numbered to 5. The cross-brand Bowman Black program continues with 25 more autographs, each of which are numbered to 25. The striking cards feature a silver on-card autograph on a black background. The highlight here is bound to be Yu Darvish. Check out a real-time list of the 50 most-watched 2012 Bowman Chrome Baseball cards currently listed on eBay. 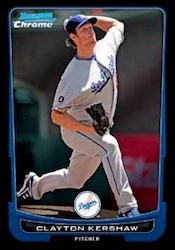 Click here for details on the Blue Wave Refractor redemption program. Andrew Chafin, 2012 Bowman Chrome 1st Card (Autograph) Rookie!!! Good: Bowman Chrome always seems to bring out some of the hottest new prospects in baseball. This year is no different. It offers a high-gloss finish on the cards, and gives a nice variety of color. This year, they have included some very nice die cuts and interesting Franchise All-Star and All-Star Futures Game inserts. As always, every box comes with at least one autograph. There is definitely the potential for solid value with all of the prospects and parallels in this product. Bad: While there is the potential for a big prospect hit, some might find the price high for only one guaranteed autograph. I like Bowman Chrome, in general, but many of the past years have the same feel with the white border and a relatively plain design. The Bottom Line: The Bowman brand is definitely something that a lot of people like, but it is not for everyone. It is great for prospecting future stars in MLB. The cards are similar each year, but they also have some potentially huge hits. Your take on this product will have a lot to do with the tradeoff between the potential of prospects and the fact there is only a single hit in the box. The addition of a couple lines of nice inserts does help, though. The base card design is nice and clean. At the same time, it is very similar to many previous Bowman Chrome designs. The photography offers some decent shots of the players on the front, and the multi-colored parallels are pleasant to the eye. The card stock has the normal curling issues that have hurt it in the past. The cards are not flat. Instead, they curl if you look at them from the side. I love the die cut insert and a couple of other new inserts this year. 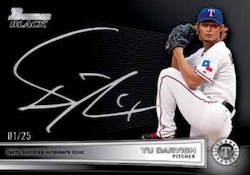 The 2012 Bowman Chrome checklist features 220 base cards, with 170 veterans and 50 rookies. There is a 110 Prospect cards. 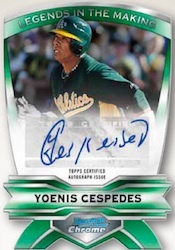 With multiple variations and parallels, patch cards, and autographs from a lot of prospects, the checklist allows just about any type of collector to chase their favorite teams and players. The addition of redemptions for hats worn at the 2012 All-Star Futures Game is a nice touch. One autograph for 60 dollars does not equal a lot of value, especially when a lot of them are trading for a lot less. There is potential for a big hit or a redemption, but the odds are definitely not in a collector's favor. The many levels of Refractors add some value, but casual buyers are likely more after the signatures. 2012 Bowman Chrome Baseball is a decent box to bust. There is so much to collect and the potential, even if it's small, to hit something big. The variety in each box adds to the excitement as well. In the end, the cards come through nicely but they are similar to other Bowman Chrome sets. bowman chrome is a product that stands on its name. always a great product. Maybe I’m wrong, but the checklist seems really weak. Anyone disagree? Too little bang for the buck on this product. $3.19 a retail pack containing ONLY 3 cards…is to little of a return. Chrome is in just about every product Topps makes. This specific series is overpriced in my humble opinion. I appreciate that Bowman Chrome breaks out the prospects from the main set because it is almost like being able to collect two sets. I am not an auto/relic hound, but I prefer to coallate my own sets through Hobby boxes (don’t get me wrong, the autos are really cool). I also really dig the refractor system and that different types of refractors can be acquired different ways (hobby, blaster, etc). It adds a fun wrinkle to collecting the set and presents new ways to trade to collect your set! Bowman Chrome is always my favorite product, in whatever of the 3 annual iterations, but the prospect autos in this particular set are not that great. From looking at this checklist and the Bowman Draft checklist, it seems like Topps is saving most of the good prospect autos for 2013 Bowman. If I had to rank the prospect autos among 2012 Bowman Chrome, 2012 Bowman Draft, and 2013 Bowman, I’d put Chrome last, Draft second, and 2013 Bowman first. I love the quality of the base cards in this set. I don’t, however, love the pricing. I broke two hobby boxes yesterday and for what I paid, the only real hits here where the ones I took at the register. Each box gave me one autograph, which I knew going in was a crapshoot at best, so no complaints, I’m certain most collectors have similar Williams Jerez/Miles Head days. But the real kick in the teeth was the one purple refractor, Ivan Nova. And somehow, out of two boxes, I managed to come up with blue refractors of the Rays out field, Zobrist and Jennings. A patch or another purple refractor would have made this a little easier to stomach. Again, I love the design, Bowman Chrome is miles ahead of Topps Chrome as far as quality chromium finished products go. I had much better luck with retail on this product than hobby which is something I’ve never experienced before. After pulling the Jorge Soler refractor auto out of a blaster and finding I could only get $70 or so for it I determined this product has terrible value. I’ve now purchased 4 hobby boxes and 10 blasters and 35 or so rack (value) packs and am pretty confident I made a huge mistake. It was a nice design and a fair checklist but the hobby boxes will insult you. I enjoy collecting Bowman products due to the wide variety of prospects. The product is consistently great in quality and value…..with the exception of Chrome. For the price (especially hobby packs) you only get three cards. That being said, there’s not enough variety of inserts in those 3 card packs for the $5 average price. I’d say $3.50 is more applicable. I’ll still buy chrome, platinum and prospects, but probably less quantity. I got three hobby boxes of bowman chrome and I am pleased with the product. The assortment of veterans, rookies, and prospects really makes this a great product to buy, especially if your into collecting rookies and prospects. I guess I wouldn’t be too out of line by suggesting maybe two hits per box instead of one and three hits per third box. Overall a great product, quality of cards are second ton none, I will continue to buy Bowman Chrome every year. I like the design, more of a regular card as opposed to platinum, but very nice mixe of players and priced right. Another job well done using the wonderful technics available to set some cards apart from the lower end. My husband and I love to open packs. So when he gets off work he stops by our local card shop and buys. A couple packs so we can enjoy our evening watching MLB network and open them..we love bowman , we love the look of the cards and how there are different inserts and colored boraders..we enjoy everything about bowman can wait to open some more..
Used to be better. Still good though. Nice set. I just got back into collecting and this is a fun set to get back into the hobby with. The look of the cards and the inserts keep me purchasing more and more. Plus it doesnt hurt that Harper, Darvish, and Trout have made the hunt all that more exciting. For the price point the hits were not great. I spent $120 on 2 hobby boxes and the only hits I got were Miles Head and Williams Jerez autos, both selling currently for about $3 each. The autograph checklist had very little value as well due to only about 5 good names. Wouldn’t buy again. This was the first case i bought in years, with the loaded rookie crop and fact that Bowman Chrome is the standard in baseball this was a great set. It had a nice mix of inserts, I actually got more autos than stated even with the bonus auto per 3 boxs, only got one redemption (of course it was for Darvish) but since it was Gold Ref it was ok, got my first Black auto which is nice, but very condition sensitive. You cant go wrong with Bowman Chrome whether looking for the quick buck or long term rookie prospecting!! opened one box. didnt really get any decent hit. I have a Matt Wisler Black Collection Autograph card that is numbered 20/25.Can someone help me find pricing and information on it? What about 2012 Bowman Chrome Prospects BCP1-110??? I’m trying to find a checklist for 2012 Bowman Chrome Prospects #1-110. I see on this page there is a checklist for #111-220 but I am unable to locate the lower numbers. Anyone have answers?